GaelSong Exclusive! When a mere glass won't do. Toast special times, or make any occasion special, with this majestic goblet. Glazed in deep blue shaded with of purple and umber, embellished with a triple spiral, each is individually thrown and glazed by master potter Colm de Ris - no two will be the same. 7" tall, holds approximately 8 oz. Handmade in Dublin, Ireland. Sorry, green no longer available. I bought this goblet for an old friend for a birthday present, and she loved it. 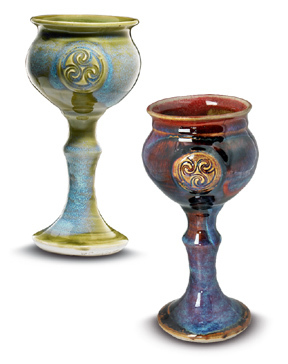 The recipient was a friend and loved the two goblets I sent her. Beautiful!! Wish I bought the set. Looked better in person than pic on website! Nice. They were a birthday gift to my brother who lives in NYC and he loved them. They were beautiful! My daughter was delighted with the gift. I am thrilled with these goblets. My daughter and future son-in-law will be using them for their summer solstice wedding toast.